Victoria Beckham, watch out for Avril Lavigne! The reason, the skatergirl going to be a rival at New York Fashion Week! Although still can not be equated with many other designers, like Chanel and Marc Jacobs, but Avril's clothing line confirmed, Abbey Dawn, will shine in this major fashion event. Together with many other designers, Avril will present the latest trends emerging in the world of fashion skater. Canadian singer who is now wrestling in the world of designer also will feature a collection of his best. But do not think Avril is simply the collection will feature costume mandatory skaters, such as hooded sweatshirts and jackets, for a variety of other types of clothing and gothic themed graffiti will arise between the rows of other designer collections. Not only the female model wearing a dress, jeans, skirts, shoes, handbags, wallets, and sunglasses, but the men will also be pampered with a special collection of men's Avril. 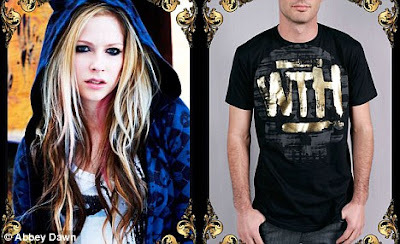 Unfortunately, many people doubt this collection of Avril, which is considered to be suitable for teens. In addition to Avril, Gwen Stefani's label, LAMB, will also be showcased on the catwalk, even though Gwen could not attend due to busy schedule of filming the movie. This is certainly different to Victoria Beckham, who was confirmed to be present, even without high heels favorite because he suffered spinal injuries.